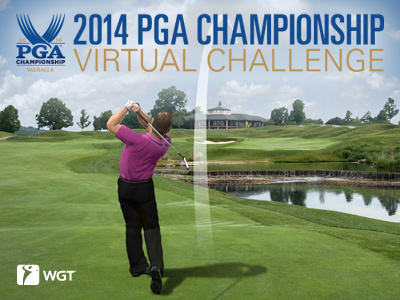 WGT has teamed up with the PGA to launch the official virtual game for the 2014 PGA Championship. Test your golf skills on the Vahalla Golf Club in a nine-hole closest-to-the-hole challenge for a chance to win the grand prize. Valhalla is a stunning and challenging golf course that has hosted 2 PGA Championships, 2 Senior PGA Championships, and the 2008 Ryder Cup that was won by the United States led by Hunter Mahan and a rookie team, less Tiger Woods due to knee injury. When you play Valhalla on WGT, you'll face approach shots at Holes 13, 16 and 18, as well as a shorter chips and a very difficult closing putt. Both the top leaderboard score AND a lucky sweepstakes winner each win a trip for two to the 2015 PGA Championship at Whistling Straits. ...and don't miss all the real-world action in the 2014 PGA Championship, the final major of the season, August 7-10 at Valhalla Golf Club. See www.pga.com for more. * Tournament is free to enter, open to WGT players in all countries and runs now thru 8/31/14. See rules for prize eligibility.